make it an absolute must-have product at home or for traveling, business trips, or just any time you're away from an outlet. an increase of 12 hours of talk time, 12 hours of Internet surfing time, 13 hours of video time. 1.Insert or remove your iphone 6/6s from charger case vertically. Make sure that the phone is well connected to the lightning connector of the charger case. 2.Long press the switch button 3s to start or stop charging. Short press the switch button 1s to check the remaining power. 4 LED indicators will show how much power is left (0--25%--50%--75%--100%). 3.When you charge the battery case with the phone attached, the phone will be charged first. 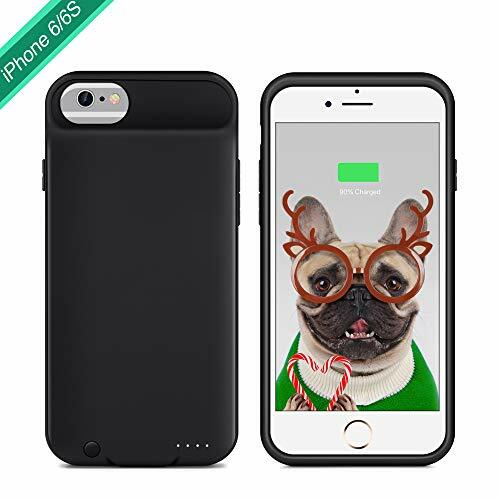 When the phone is fully charged, the battery case will be charged next. Please use original apple lightning cable and wall adapter (5V/1A Only) to charge. with an 12-month warranty and provide friendly, easy-to-reach support. The most portable charger case for women, men, girls, kids. Wish everyone that matters in your life a powerful new year.